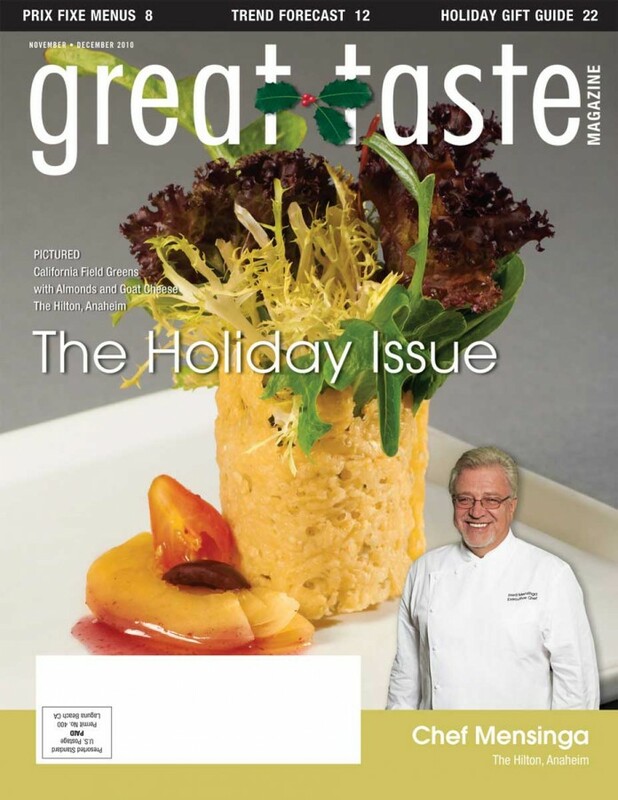 Great Taste Magazine 2010 Nov/Dec Issue features Chef Fred Mensinga with Orange County restaurants and professionals with resources, recipes, beautiful photos and many tasty tidbits. While Southern California struggles to distinguish the seasons with its confusing weather conditions, chefs gather up spices and recipes to remind us that we should start preparing for the holidays. Tis the season! Start with the tidbits and kudos to discover the good news about OC and neighboring restaurants. Then, check out what Chef Gabriel Caliendo has in The Spice Rack. Chef Caliendo discusses how you can sweeten holiday spirits with cinnamon. Add it to a cup of Chai Tea or to savory dishes. This month’s Cheese Pick, Rogue River Blue Cheese, is smooth, rich, and sweet. With berries, sweet woodsy pine, hazelnuts, and pears, this cheese is another sweet addition to any recipe. In “Take it or Leave it,” Chef Adam Navidi gives an update about the food industry and shares his holiday horror stories about genetically modified foods. In The Baking Rack, Chef Katie Averill shares her recipe for a gingerbread cake. It is perfect to bring to the family potluck dinner. As a gift to the community, many restaurants have prepared prix fixe menus that were released before Christmas time. Chef Ahmed Labbate of Charlie Palmer at Bloomingdale’s South Coast Plaza talks about this season’s restaurant trends in prix fixe menus as well as the advantages and disadvantages of these menus. For more insight on restaurant trends, Southern California chefs discuss their hopes, speculations, and goals for the restaurant industry in the new year. Also this month, our featured chef, Chef Fred Mensinga shares his journey through Germany and culinary school, and how he came to be a culinary professional in America. Finally, Chris Kern, founder of ForgottenGrapes.com and creator of Sunday Night Chef Fights, gets the inside scoop in 2011’s wine trends. Keep an eye out and find the great taste in a bottle of wine. If any of our readers are last-minute Christmas shoppers, have a look at the Holiday Gift Guide. There are many items that will come in handy in the kitchen. 2011, here we come! Great Taste Magazine 2010 Nov/Dec Issue covers the restaurants and the professionals with resources, recipes, beautiful photos and many tasty tidbits. Great Taste Magazine, the premiere connection to all the key decision makers in our local Southern California restaurant industry. Each month our 15 year-old full-color trade publication reaches thousands of the area’s top restaurant owners, general managers, executive chefs and buyers. Take a tour through the magazine. Each issue features a restaurant and local chef, and is packed with the timeliest information, critical operational tips and other industry news important to our readers.